I am proud to have served patients in our community for over 28 years. The combination of continuing education and state of the art equipment and materials allows us to offer you the exceptional dental care you deserve. Plus you'll enjoy our friendly, caring team members and relaxed atmosphere. Our goals for all of our patients is to save their teeth when possible, to be free of pain, to function comfortably, to promote optimal oral health, and to be happy with the appearance of their teeth. 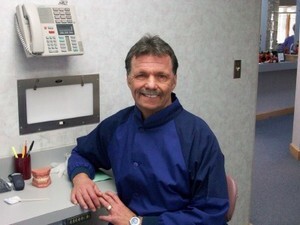 Dr. Mark Weinhold is a 1981 graduate of Creighton University Dental School in Omaha, Nebraska. He places great importance upon enthusiasm in the office, and impresses this upon his staff, saying,"since the traditional experience in a dental office has been negative we will work hard to make our patients feel comfortable about being here. A strong proponent of continuing education, Dr. Weinhold has completed hundreds of hours of lectures and hands on training. He has completed the seminar series,"The Concept of Complete Dentistry" at the Dawson Center for Advanced Dental Study, as well as the seven course Continuum at the prestigious Pankey Institute. The course content included cosmetic techniques , TMJ disorders, implants, periodontal disease, and complex restorative case designs. Dr. Weinhold has also kept abreast of the growing field of Dental Sleep Medicine. He is qualified to treat snoring and mild to moderate sleep apnea with an oral appliance. This also may be used for those patients who cannot tolerate the CPAP machine. Dr. Mark Weinhold is a member of the American Dental Association, Illinois Dental Society, Fox River Valley Dental Society, International Academy of Mini Dental Implants, American Equilibration Society, and the American Academy of Dental Sleep Medicine. He participates actively in community cultural enrichment and services.